Why did the confluence of river gorge, enormous waves, and wild indigenous forests affect me so? Indeed, what magnet drew great-grandfather Laurance Garvie from Scotland to these very forests near Knysna? I don't know but near the mouth of the Storms River is a cave that might well hold the answer. 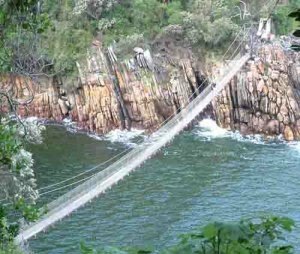 You get to it by means of a scary suspension bridge swaying over the restless tides far below. The synchronicity of sea, skies, and the sun coalesced there for me in that cave, "deep and very dark and eerie". Curious as that experience might be, ancestral memories haven't been scientifically proved but our DNA could very well hold the key. Are we not all collectively joined together by invisible threads and family ties? Whatever this feeling of connectedness to a particular place might be, Storms River Mouth remains for me one of several magical "thin places" I've come to revere here in South Africa.